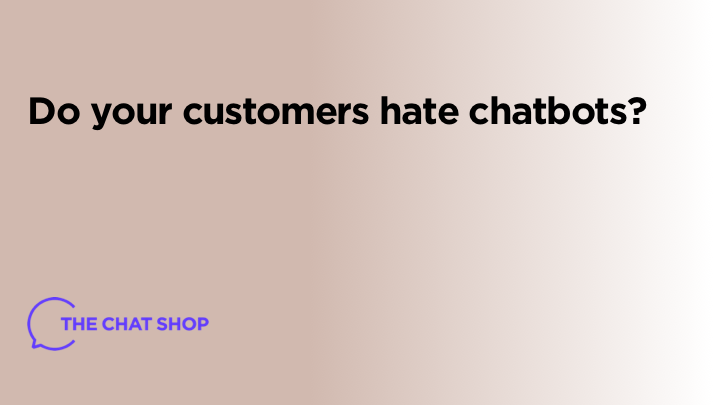 Chatbots have quite the reputation…but do your customers really hate them? Sometimes human interaction cannot be replaced by technology. We’ve seen it in many situations by now. For example, grammar and spelling software is not even close to replacing real editors. It’s good, but it’s not that good. Customer service is another category where the use of automation is a matter of dispute, to say the least. Still, the standalone chatbot industry is thriving, and we better take that for a fact. 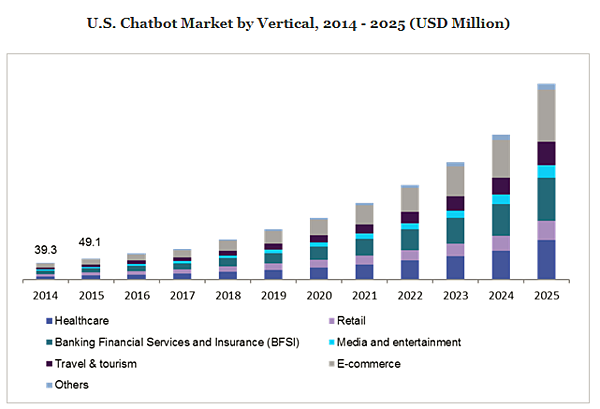 According to a report provided by Grand View Research, chatbot market size is expected to reach $1.25 billion by 2025. There are reasons for hate! 53% of the responded found this software to be ineffective or only somewhat effective. 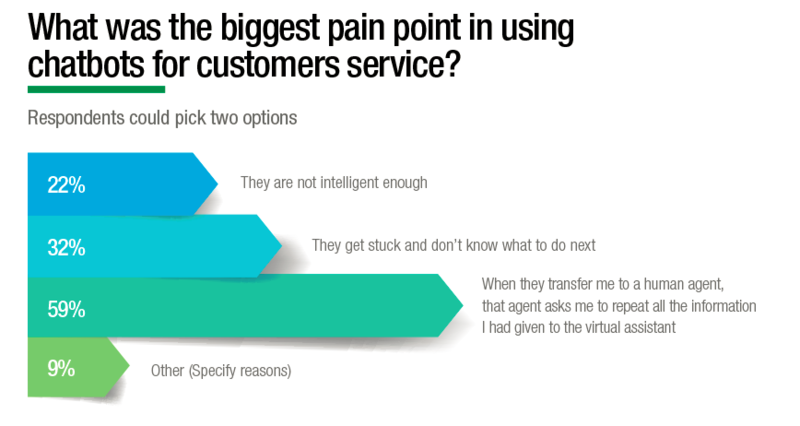 59% of respondents complained about the need to repeat information to an actual customer support agent after getting through the chatbot. 22% of the respondents said “they are not intelligent enough” when asked why they didn’t like chatbots. What does this tell us? Customers mainly hate chatbots because they are not sophisticated enough to mimic the human approach. They are too cold and they lack intelligence and empathy. Oracle polled 800 senior marketing and sales professionals and revealed that chatbots are set to surge. 80% of brands will be relying on chatbots for customer interactions by 2020, and 36% have already implemented such technology in their business practices. So there’s that. Companies were being careful with this technology at first, but now they are all hopping on board. Why does this happen when customer-centered surveys obviously show impatience towards chatbots? The answer is clear: there’s tons of potential in this technology, so companies are trying to advance it in a way that meets people’s needs and make their customer support departments more effective at the same time. Can we overcome the chatbot drawbacks? Of course, we can! There are huge advantages to this technology if we’re only willing to develop it further. The good news is that not all customer-centered surveys show such negative perception towards chatbots. As always, we cannot take the results from one survey as facts. Another survey, provided by LivePerson, showed that chatbots are getting more popular, and 38% of consumers rated their overall perception as positive. When we talk about the disadvantages of chatbots, we have to mention the advantages, too. The pro/con list will give us a realistic impression of the forecast. So what are the major advantages? Chatbots are better for delivering quick answers in an emergency. If, for example, you just got a new TV set and you have absolutely no idea how to install it because you lost the instructions, you’d definitely need to hold in line to get to a customer service agent. A chatbot, on the other hand, would immediately recognize your problem and deliver the instructions you need. No waiting, no hassle. Just direct answers, right away! When properly programmed, chatbots are good at resolving problems. You pick a category that covers your problem, and the chatbot will deliver relevant solutions. If you don’t find your answers there, the chatbot will connect you with a customer service agent. Fortunately, companies now understand the fact that you don’t want to repeat the same information to the agent. Before attending you, they will go through the chat you had with the bot, so they will already have basic information to start the conversation with. A chatbot helps the customer get to the right customer service agent. If you have troubles with the TV set, what’s exactly the problem? If it’s a technical issue, the bot will direct you towards an agent skilled to assist you with the technicalities. If you want to return the product, you’ll get connected with an agent in charge of such services. Instead of a human agent attending you and then directing you to the right department, a chatbot will make things much faster and more effective. Simple questions are great for chatbots. If you cannot find pricing information on a website, for example, you can simply type: “How much does this package cost?” You’ll get a straightforward answer, with no hassle at all! 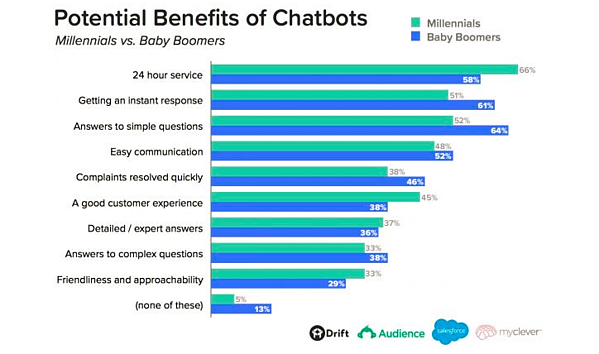 Millennials don’t mind chatbots that much. Research on the current state of chatbots is pretty clear on that. 66% of Millennials see chatbots as a nice way to get 24-hour service. 45% of them expect chatbots to contribute towards a positive customer experience, and 33% are happy with the friendliness and approachability. The same report showed that Baby Boomers also had positive expectations from chatbots shows that this technology is gaining traction by the day. In many situations, customers prefer contact with real people. There’s no doubt about it. If your chatbot takes them back and forth, making them repeat the question and still not delivering answers, it’s no good. If it forwards them to a live chat agent and they still have to repeat the information, it’s no good at all. But we must also consider the fact that chatbots are getting better, and the customers are getting more receptive towards that technology. When done properly, chatbots will benefit both your business and your customers. Warren is a marketing enthusiast and a blogger at Resumesplanet.com, who loves music. If he doesn’t have a guitar in his hands, he’s probably embracing new technologies and marketing techniques online! You can meet him on Twitter and Facebook.